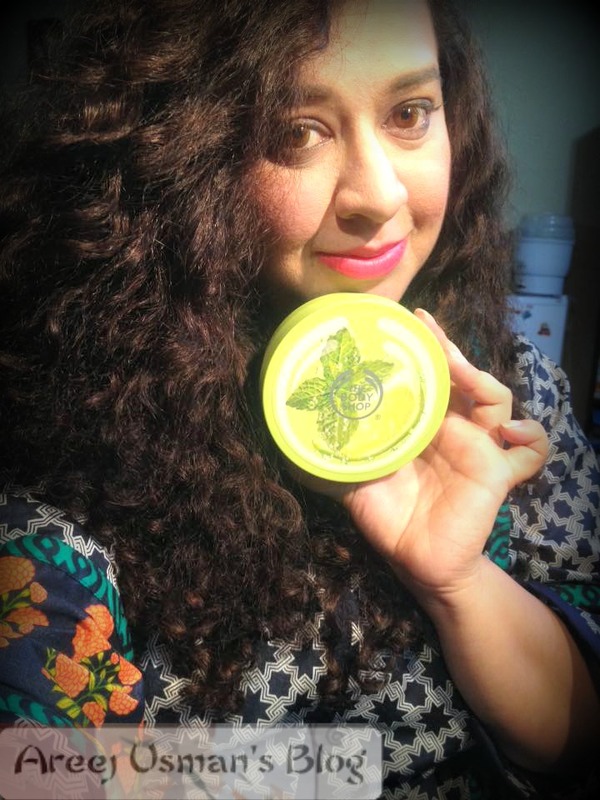 A few days back I received a large goody bag at a Ramadan special charity event from The Body Shop Pakistan & I admit it was one of the best goody bags I have got till now.In the goody bag was this amazing product that I am reviewing today! 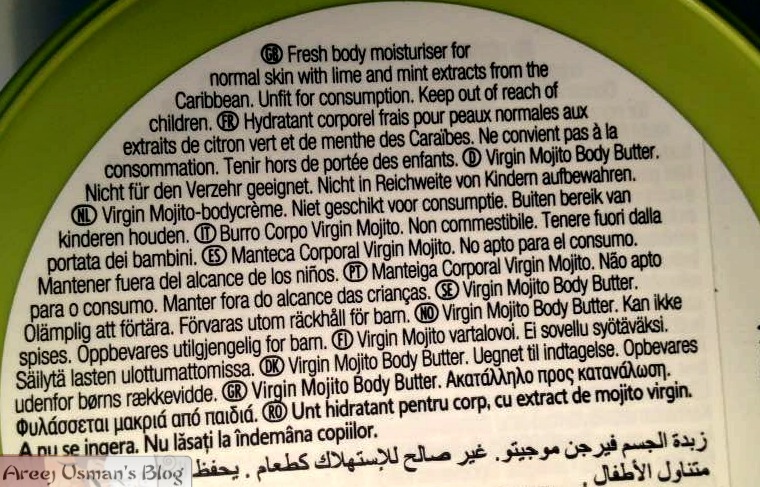 Its the Virgin Mojito Body Butter! Aqua/Water/Eau, Theobroma Cacao Seed Butter/Theobroma Cacao (Cocoa) Seed Butter, Butyrospermum Parkii Butter/Butyrospermum Parkii (Shea) Butter, Glycerin, Cetearyl Alcohol, Glyceryl Stearate, PEG-100 Stearate, Glycine Soja Oil/Glycine Soja (Soybean) Oil, Ethylhexyl Palmitate, C12-15 Alkyl Benzoate, Cera Alba/Beeswax/Cire d’abeille, Sesamum Indicum Seed Oil/Sesamum Indicum (Sesame) Seed Oil, Parfum/Fragrance, Bertholletia Excelsa Seed Oil, Dimethicone, Sucrose, Caprylyl Glycol, Phenoxyethanol, Limonene, Xanthan Gum, Citral, Tocopherol, Disodium EDTA, Sodium Hydroxide, Linalool, Citric Acid, Citrus Aurantifolia Fruit Extract/Citrus Aurantifolia (Lime) Fruit Extract, Benzoate, Potassium Sorbate, CI 19140/Yellow 5, CI 42090/Blue 1. The Body Shop Body Butter comes in a large round good looking plastic tub that has a screw lid.One doesn’t has to worry about acciddental opening and messes.Though I would love to carry it around in my bag but this size i.e 200ml tub is a bit big to pop in your purse.I would appreciate the smaller packaging for my bag. 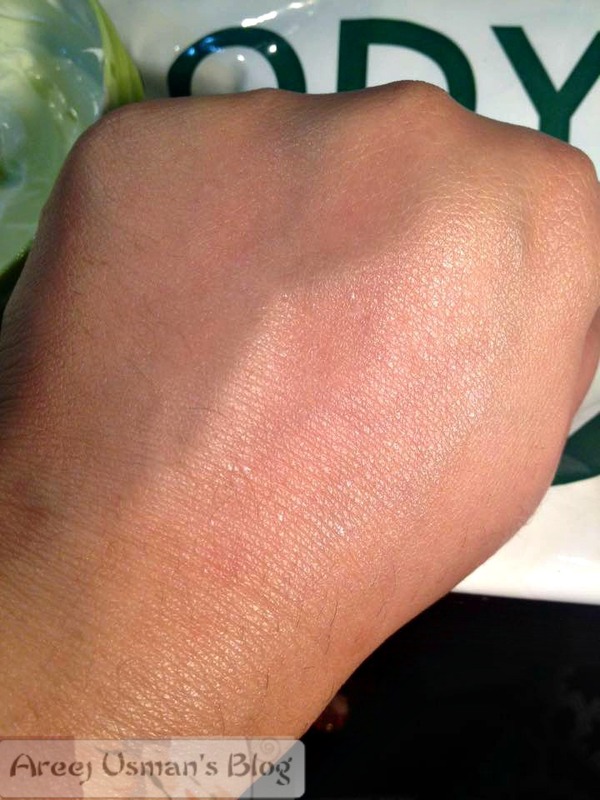 The texture of the body butter is thick and once applied onto the skin,doesnt go away is a rub.You have to massage in onto the skin for a couple of minutes before it totally absorbs.Once absorbed it has no greasy feeling on the skin.Though the skin may appear shiny and glowing but it isnt greasy at all to touch.Just soft smooth skin.This Body Butter provides deep moisturization and hydration to the skin.I love to apply it at night time to my hands and feet,or usually after a dip in the pool because skin tends to get dry after swimming and this is the best product to keep the moisture in. If I apply the body butter at night the soft hydrated effect remains until morning.Thats why I will term it as a product that gives hours and hours of soft well hydrated smooth skin. 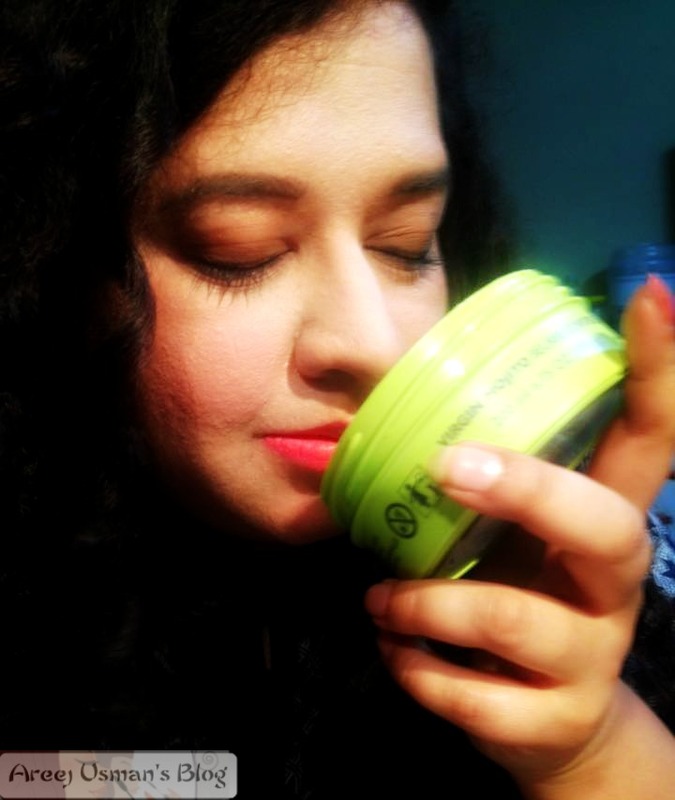 As far as the fragrance is concerned,its a mixture of zesty lime and soothing mint,I love citrusy scents and thats why I can just keep smelling it like forever.Though I have never tasted a Mojito but I can imagine what a mojito would be like!The scent is a light too,not a strong one thankfully as strong scented skin products make my head spin. Oh and another important thing is that the Entire Virgin Mojito skincare line is a limited time offer.It will be gone soon.So if you want to grab anything out of the exciting range rush before its gone already. 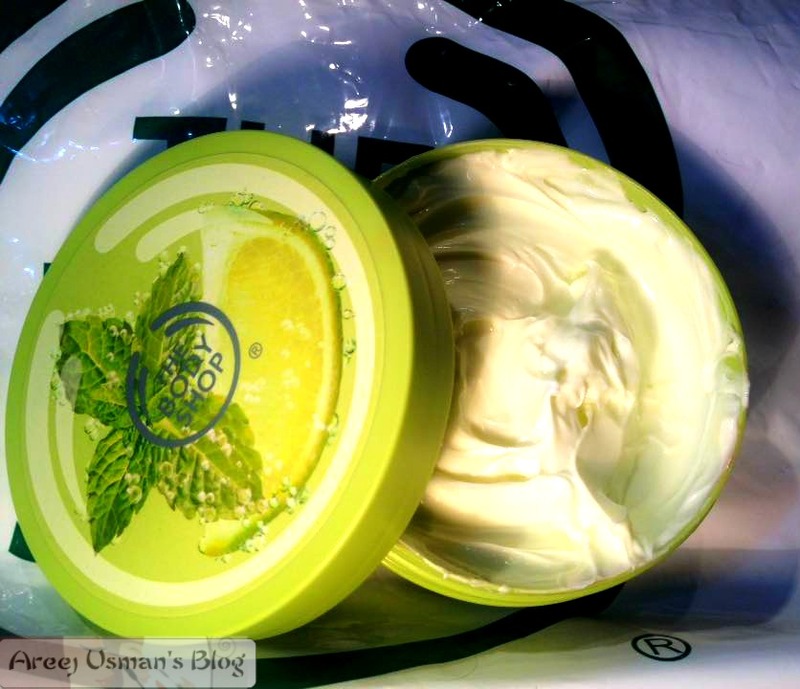 I am already loving my Virgin Mojito Body Butter ! Have you got yours yet! I totally love this product and recommend it to you all as its scent makes it the perfect summer skincare solution. 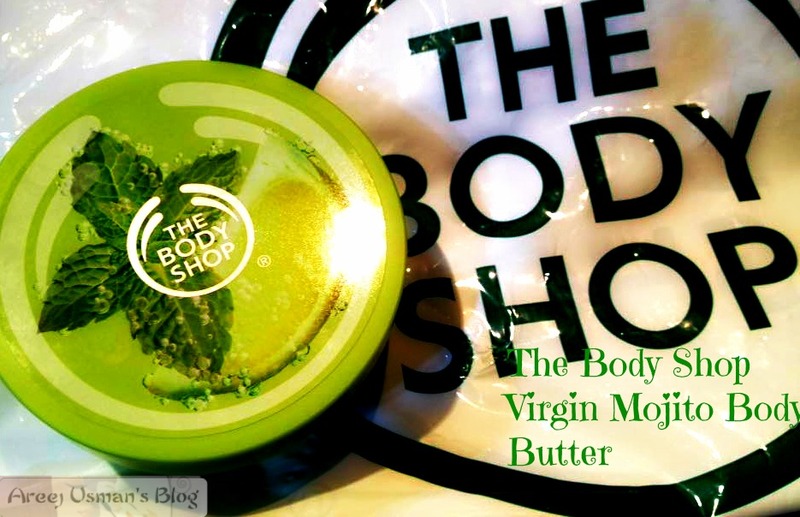 It is available at all The Body Shop outlets nationwide. Very helpful review. Thank you ! This is soaahoo amazing…. Love this scent. That photo of you smelling it even makes me want to smell it!